Excerpted fromA Season inMeccaby Abdellah Hammoudi. Copyright 2005 by Editions du Seuil Translation copyright 2006 by Farrar, Straus and Giroux, LLC. Published January 2006 by Hill and Wang, a division of Farrar, Straus and Giroux, LLC. All rights reserved. 1 DEPARTURES my departure for islam's holy sites was no easy matter. There were the time-consuming travel preparations, and then long weeks spent going through the procedures required for the pilgrimagecomplicated further by my being a resident of both the United States and Morocco. 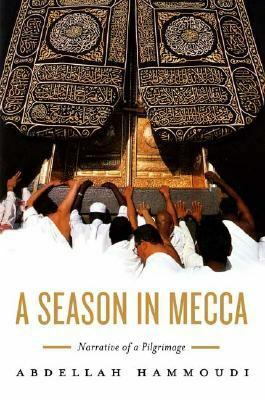 But this was the common lot of every pilgrim who in the same circumstances chose to undertake the trip to Mecca that spring of the year 1419 of the Hegirathat is, 1999. What took me by surprise was that a malaise engulfed me, and I couldn't tell whether it would intensify or disappear. It turned out to be lasting, so coloring my life that it became my future. As the date approached that the Muslim calendar fixed for the departure, I felt not that I was moving toward it but that it was advancing, coming to meet me, catching up with me. This surely was the cause of my malaise. I was floating, tossed and turned by contradictions. Who exactly was this man setting off like this, whose life and activities had for decades found their meaning elsewhere? For me, the hajj had long ceased to signal salvation or a successful life. It was of course one of the famous five pillars of Islamalong with the profession of faith, prayer, fasting, and charityestablished after the initial revelation, when the Prophet called for the teachings of Ibrahim (Abraham) to be restored, when as Muslim tradition has it, eternal Islam was rediscovered after the long period of decadence of pre-Islamic times. I had professed my faith, prayed, and fasted. I regularly gave to charity, and now I was about to go on pilgrimage. But all this was going on in a time frame that was not exactly mine anymore; it belonged, rather, to my identifying traditions, "beliefs and practices" attributed to the society I came from, which were objects of anthropological discoursemine and other people's. It was in this mindset that I had begun to plan this project the year before. I had wanted to approach it as I had the subject of sacrifice in my earlier workby reporting on every last detail of what was said and done. I hoped that in this first stage I would come to understand the meanings that pilgrims gave to their actions and to the sequence in which they would accomplish them. I wanted to understand the relation between each action and those preceding and following it. And I expected this first part of my work, yielding new theoretical perspectives illuminated by what pilgrims said about their experiences, to transcend mere description. I thought I could thereby understand religion through one of its concrete forms, and understand those who practice it today. From experience, I knew it would be with my difference that I would achieve this "first description." As in my previous work on sacrifice and on masquerade, on rites of power and ritual power, my task would be to imagine Muslim religious life in the future tense, a religion in process whose traces I would follow in the past and present. And once again I knew my research would be very different from that of anthropologists who come to the study of Muslim tradition by other paths. Still, as I made these plans, I had not foreseen the feelings that now I could no longer elude, for the more imminent and real my departure became, the more it seemed to authorize, even free up, certain words; I began to express my unease and anxiety in inadequate formulas that left much unsaid; but despite my regularly reminding myself and those around me of my worriHammoudi, Abdellah is the author of 'Season in Mecca Narrative of a Pilgrimage', published 2006 under ISBN 9780809076093 and ISBN 0809076098.